Another one of the those fun story-telling R&B doo wop songs written by Jerry Leiber and Mike Stoller is “Little Egypt.” In this case, it’s the story of how the singer found a love of many talents. The track was released in 1961 as a single, with the B-Side “Keep on Rolling,” and went to #16 on the R&B Chart and #23 on the Billboard Hot 100. The song was also on the 1962 Coast Along with the Coasters album. 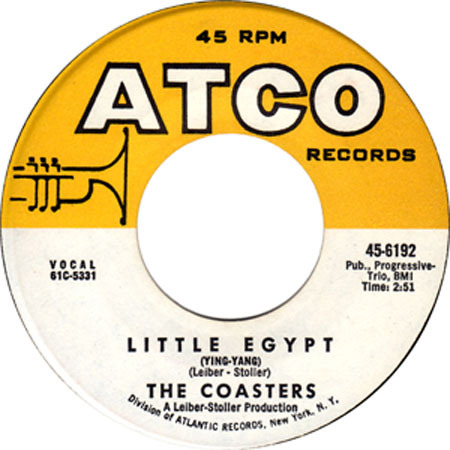 There have been covers of “Little Egypt,” including versions by The Downliners Sect, Elvis Presley, and Cher. The Coasters formed in 1955 in as a spin-off of The Robins, which was a Los Angeles-based rhythm and blues group. Only Carl Gardner and Bobby Nunn moved to New York. Nunn left the group after a while, and the famous lineup was Gardner, Billy Guy, Will “Dub” Jones, and Cornell Gunter. The Coasters had many hits, including “Charlie Brown,” “Down in Mexico,” “Yakety Yak,” “Searchin’,” “Young Blood,” and “Along Came Jones,” among many others. Needless to say, there were plenty of personnel changes after that, and The Coasters still perform today. Please click here for our Youtube channel, to which you can subscribe. Thank you for stopping by The Daily Doo Wop. Hope you enjoyed “Little Egypt” by The Coasters.